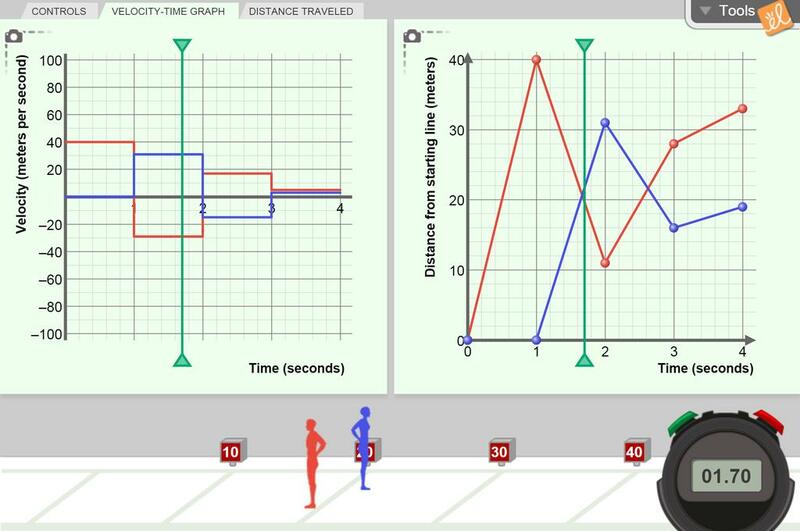 Create a graph of a runner's position versus time and watch the runner run a 40-meter dash based on the graph you made. Notice the connection between the slope of the line and the velocity of the runner. Add a second runner (a second graph) and connect real-world meaning to the intersection of two graphs. Also experiment with a graph of velocity versus time for the runners, and also distance traveled versus time. Students describe the race as a sports reporter would, using a graph snapshot. You can also have students... (more) begin writing, switch papers with another student, and continue where they left off describing the race. Running man now races a competitor. Graph snapshots have corresponding questions. Introduces solutions of... (more) systems of linear equations. Snapshots of graphs that represent seperate races run. Questions include finding slope (meters per second... (more)) and the y-intercept. Calculate velocity and acceleration using a ball and ramp. Could be used as a hands on follow up lab to ... (more)the Gizmo. Could also be used as an alternative assignment for the Gizmo for students with a limited reading ability. Intuitive interface design gets students into the graphing relationships quickly. Good tool tips. Great for an introduction or a refresher! This is a difficult concept to teach so this simulation provide clear details on d-t graphs. My students also acted this out on the track.